An Eagle recorded a first-place finish in every single event at Emory’s home-turf meet on Jan. 26. Both the Emory men’s and women’s swimming and diving teams emerged with powerful victories, with final scores for the meet against the Centre College Colonels (Ky.) adding to 188-95 and 156-95 for the men and women, respectively. On their celebratory Senior Day, 11 seniors put up first-place times in solo or relay events. Although Emory couldn’t bring home all the points available because some events were won by exhibition swimmers, the Eagles accumulated 28 wins for the home team in swimming, as well as two high marks in uncontested diving. The star from the men’s senior class was Zachary Chen, who placed first in the 100-yard backstroke (51.89) and the 200-yard breaststroke (2:10.07). Seniors Trey Kolleck, Matt Rogers and Thomas Gordon also claimed gold medals in solo events, and Patrick Leonard earned one in a relay event. Sophomore Kellen Stillman represented the underclassmen with two individual wins. On the women’s side, the leading seniors were Julia Durmer and Fiona Muir. Durmer alone brought in three first-place times in the 1,000-yard freestyle (10:25.62), 200-yard breaststroke (2:24.79) and 200-yard individual medley (2:09.69, exhibition). Muir claimed victories in the 50-yard freestyle (24.40) and 100-yard butterfly (58.49, exhibition). Other Emory seniors with winning times included Ashley Daniels in the 100-yard breaststroke (1:06.76), and Anya Kone, Hannah Baratz and Meg Taylor in relay events. The diving portion of the meet was also uncontested by Centre. 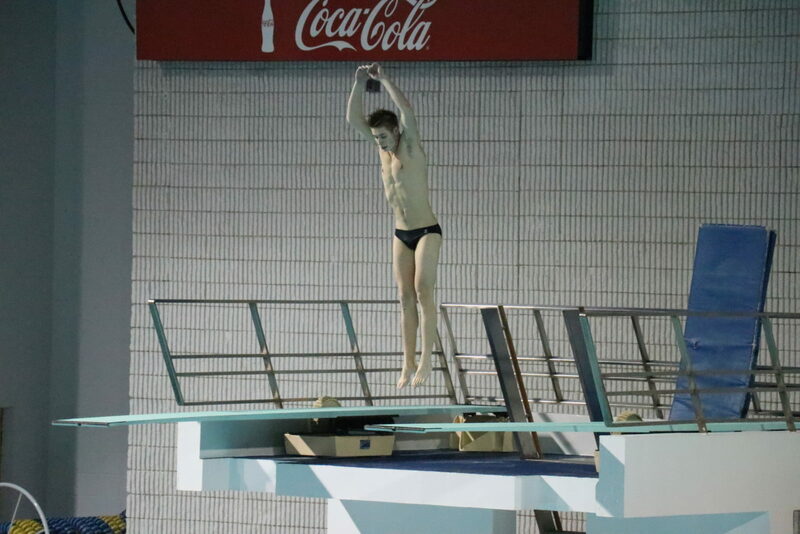 Freshman Lucas Bumgarner came in first in both the 3-meter and 1-meter dives with scores of 366.68 and 309.85, respectively. A strong showing at home will be the perfect way for Emory to prepare for the difficult trip 70 miles east next weekend at the University of Georgia (UGA), which beat both Emory’s men’s and women’s teams when they met last February. A formidable meet on the road will test Emory’s persistence in the pool, just a week after their dominating performance at home. The Eagles will splash down again versus UGA on Feb. 2 at 11 a.m. in Athens, Ga.